The CCUSD School Board meeting of December 11, 2018 saw a new member added, a new President seated, and lots of spirited presentation from the arts education department. 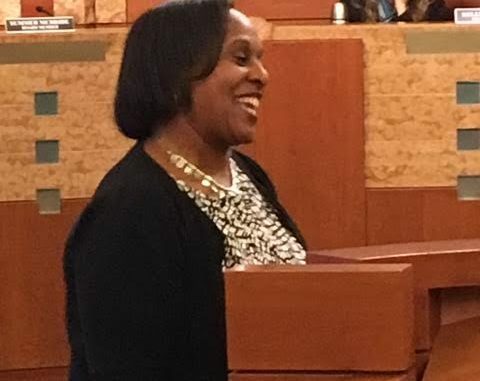 While school board members Steve Levin and Summer McBride re-took their seats for another term, Tashon McKeithan was sworn in to take the seat just vacated by Katy Paspalis after nine years. As there were only three candidates for three open seats, there was no election campaign for voters. Sitting President Anne Allaire stepped down, and Dr. Kelly Kent was given the gavel to preside over the next session of the board. Over half–3 out of 5 members, now sitting on the board, were not vetted by the voting public or faced any campaign scrutiny during the last election cycle. This was due to the number of candidates running for the office. Steve Levin was elected four years ago and then, waltzed back in without ever having to run on his past deficit spending record. Two of the current board members have yet to face voters or receive a single vote in an actual election. Summer McBride was appointed to the Board by previous members about two years ago and Tashon McKeithan ran unopposed this past election. It is hoped that with Ms McKeithan joining the board, she will bring some fiscal common sense to this seemingly debt-ridden board, and show other members how to be more fiscally responsible.